While some prefer cutting their hair short into cool and fashionable haircuts, most Indian women love keeping their hair long. In fact, having long gorgeous hair according to me is a blessing more so in such polluted environment that constantly leads to hair loss and hair damage. However, with long hair comes added responsibility and that responsibility is to maintain long hair that has been naturally gifted to you. Maintaining short hair is comparatively easier than maintaining long hair and so extra effort must be given on your part to keep your long hair shiny and gorgeous. Therefore, if you are blessed with long locks and wondering how to maintain it properly, then here is the post worth reading for you. Here I have talked about 23 of the most efficient yet simple and easy tips to maintain long hair that you will simply love. Hair forms an essential part of women’s beauty and long locks simply add on to it. If your hair is voluminous and long, you can try any hairstyle you want. You may tie it into a loose bun, or make some stylish braids or simply keep it open. Nevertheless, what sometimes surprises me is that, despite being blessed with long hair, many women prefer cutting their hair short, all thanks to the pollution and unhealthy lifestyle that makes it difficult for them to maintain the long hair. However, what they fail to understand is that cutting the hair short may seem an easy solution but at the end of the day, they have to compromise with the naturally long hair they were blessed with. 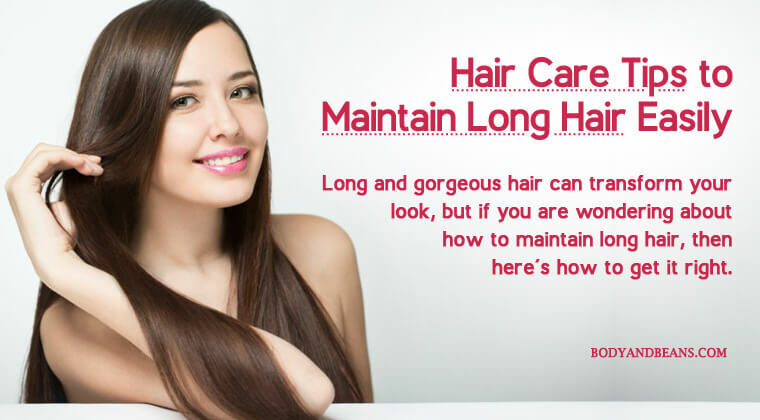 So, I personally suggest people with long hair to kindly take little time out from their busy schedule and use these simple and effective tips to maintain long hair easily. In today’s post, I have jotted down 23 simple tips that will help anyone maintain long hair easily. These tips and remedies to maintain long hair generally do not take much time or too much of extra effort and, are simple and cost effective. So why not try these and decide their relevance in hair care for yourself? I myself have medium length hair and simply love it. In fact, I am planning to keep it long henceforth. And, if you also love long hair as much as I do, and you do not want to cut it short, then try some of these tips to maintain long hair and thank me later. Excited to know more? I hear you saying yes. So without wasting much time, let’s begin with the list of top 23 tips to maintain long hair. Some of these tips may sound like pretty simple, but trust me they are highly beneficial in maintaining long hair. Until now, in my other posts on haircare, I have talked about various home remedies using natural ingredients to get rid of various hair problems be it frizzy hair, hair fall or premature graying etc. but today I thought of discussing specifically on long hair as it definitely needs more attention. Although the hair benefits of the natural ingredients like coconut oil, curd, onion juice etc. are undeniable, long hair needs some added care. Sometimes even slight changes in hair care routine or a little habitual change in your lifestyle can have amazingly good effects on your hair. And, here is my list of top 23 tips to maintain long hair that will never fail to impress you. Just like you cannot survive without food and water, your hair needs proper nutrition to fight against the various hair problems. For that, you have to oil your hair at least two times weekly. Oil provides strength to your hair and helps rejuvenates the dead hair shafts. It is preferable to use warm oil for better benefits. Take adequate amount of oil (preferably coconut oil) and warm it. Apply on your scalp and massage it gently with your fingertips. Apply nicely to the hair strands and let the oil soak deep inside. Then wrap a hot towel around your head and keep it for 10-15 minutes. After 2 hours, wash your hair using a mild shampoo. Repeat this method two times weekly to get remarkable results. Ok, I understand that your long hair gets dirty easily especially when you go out on a regular basis, but daily shampooing is not a solution to that. Instead, the sulfates in shampoo leaves your hair dry and frizzy and the ultimate purpose of shampooing your hair will be lost. So shampoo your hair 2-3 times weekly. This will allow the natural oils to penetrate through your hair and lead to proper hydration and repair of damaged hair. Besides, your hair will also remain clean and shiny. Not just shampooing 2-3 times weekly will help but the technique of shampooing also matters. Many people rub the shampoo harshly that damages the hair. The proper way is to simply lather your shampoo on the wet hair and then gently slide it down to the hair strands. Repeat this for a while and then wash off with water. Also, it is mandatory to comb your hair properly and remove the fizz before you shampoo your hair. Using proper shampoo is equally important. Choose one depending on your hair type although a mild one will suit most of you. Avoid the highly perfumed ones as they contain more chemicals. Your hair needs proper conditioning and you must never miss it out. In fact, conditioning your hair must be done more often than shampooing your locks. A good conditioner does not let the hair get dry, locks the moisture and gives protection against the dirt and the pollution largely. It also aids in replacing the proteins and the lipids inside your hair and seals the cuticles that help to prevent hair damage. There are many conditioners available and you can use one that suits you well. I personally prefer natural homemade conditioning packs that you can definitely include as a integral part of your hair care routine to maintain your long hair. While hair spa is great for your hair, not all can afford it or have time to hit the parlor frequently that is when we need to take care of our long hair more. But, taking care of hair does not mean you have to take the short cut route by opting for various commercial products that promises overnight result. Most of these products contain harmful chemicals that can damage your hair immensely, so my suggestion is to go for the natural ingredients. If you see my posts on hair, you will find names of several natural kitchen ingredients that have the potential to reward you with shiny and healthy hair. You may eat the edible ones to get the hair benefits or use them as hair masks. Some of these ingredients are singularly enough to give good benefits while others can be mixed together to form good hair masks. But the ingredients to choose mainly depends on your hair type, scalp type and hair issue you are facing. In winter, we need to take bath with warm water but remember using hot water too much harms your hair. This is because warm water takes away the moisture and leaves your hair dry and dull. So as far as winter is concerned, use lukewarm water to rinse your hair. Also, finish your shower by rinsing with cold water. This seals the cuticles and makes your hair shafts strong. After you shampoo your hair, rub your towel gently and then leave it open to dry naturally. This is the best way to dry your hair. However, if you are in a hurry and need to go out, you may wrap a gentle towel across your hair and keep it for sometimes. This will dry your hair comparatively faster. If you love your long locks and do not want your hairs to fall, please avoid brushing your long hair when wet. This is a complete NO-NO because your wet hair stretches more and breaks easily in comparison to your dry hair. However, if your wet hair has got entangled, then use your fingers to gently detangle it. The brush you use to comb your hair is very important. Try to use a wide toothcomb, as it is good for your hair mainly if your hair is wet or entangled. Such combs minimize the friction while brushing and prevents hair breakage. A brush made of natural fiber is good for example the boar bristle. If you brush your hair gently with wide toothcomb, your hair will never be caught or tied in a knot which in turn will keep your hair silky smooth. Also, try to brush your entangled hair in a gentle manner. Start by combing the ends of the hair and then move to the top. This will not put any pressure on your hair especially the roots and thus prevent hair breakage. Apart from choosing the right brush, it is important to keep your brush clean. The combs are often covered with hair, oil or other dirt and their buildup can make your comb breeding ground for bacteria. So make sure you clean it at least once a month using baking soda and lukewarm water or warm water and adequate shampoo. The styling tools are one of the biggest reasons behind your damaged hair and you must try to avoid them as much as possible. The various blow driers, straightening/curling machines are harmful for your hair. Excess heat and chemicals makes your hair dry, lifeless and susceptible to breakage. So avoid over styling and use natural ways of straightening or curling hair. Heat damages your hair largely, so it is preferable to protect your hair from heat but if you occasionally blow dry your hair or find your excessively damaged due to heat, try to use a good heat protectant. In fact, it is especially needed if you are living in a humid country like India. Some natural ingredients like grapeseed oil, almond oil, shea butter etc. acts as protective layers on your hair. You may try these out. They protect your hair and prevent hair damage. Please try to avoid coloring your hair often. Occasionally, it is ok as it can make your look stylish but doing it frequently can damage it largely. Most of the commercial products contain lot of chemicals that damages your hair and leads to severe hair loss. So try to remain satisfied with your natural hair or use natural ingredients like coffee, tea, beet juice, carrot juice etc to get natural tinges. Hair tied into a nice ponytail looks smart but tying it too tight is harmful. Tight ponytails cause stress on the hair roots and excess friction ultimately breaks your hair. You can tie ponytails but do not make it too tight. Moreover, your hair is long, so you many try out other loose hairstyles as well. Cotton may be soothing to your skin but not much for your hair. So ditch your pillowcases made of cotton and instead choose the satin or silk fabrics. Satin and silk is good for your hair and such fabrics keep your hair smooth and healthy. The softer surface reduces friction and hence your hair entangles less. While we are sleeping, we are not in our conscious senses and in that unconsciousness; we end up damaging our hair a lot. First mistake we do is to keep our hair open. Well, it causes more friction and hence damages hair lot. However, tying your hair too tight is also harmful, so it is better you tie hair loosely. A loose braid is a good idea. This will both reduce friction as well as not exert excess pressure on your hair roots. We all know how dangerous the pollution, dust and dirt is for your hair so while you are out try to protect your hair. In fact, not just the pollution, even strong wind and scorching sunrays, damage your hair follicles a lot. Therefore, since you got long locks, it is preferable not to keep your hair open every time you go out. Occasionally it is all right but regularly keeping it open increases its exposure to the dust, wind, pollution etc. You can also wear a cap, wrap a scarf, while you are out, or tie your hair into beautiful hairstyles that will look good as well as limit the exposure. Although this is always not in your hand and I understand that. But if possible try to remain relaxed and stress free. Stress is one of the main causes behind your health issues and it also affects your skin and hair largely. More the stress more will be your hair loss. Therefore, if you can stay happy and lively, your hair will also remain gorgeous all the time. What you eat not just affects your health but also your skin and hair. Therefore, if you want to maintain your long hair, you need to eat right. 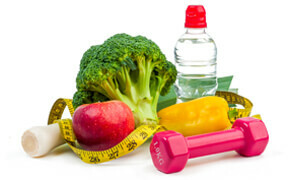 Include proteins, vitamins in your diet. Proteins promote hair growth while vitamins help maintain its shine and avoid breakage with a special reference to Vitamin E that is extremely beneficial for your hair. You should never forget to include lots of dry fruits and green leafy vegetables in your diet and discard the oily spicy stuffs instead. Not just healthy foods, drinking plenty of water is equally important. Dehydration leads to dry scalp that result to frizzy lifeless hair. Water also improves the circulation of hair to your scalp that in turn promotes hair growth. It also detoxifies your system, which has a positive impact on your hair. So try to consume water and other fluids and maintain those gorgeous locks. I know you love your hair but please avoid touching it often. I have seen many often playing with the hair unknowingly, so thought of sharing this. Frequent touching your hair hampers your hair as your hand may contain dirt and dust particles, which damages hair quality. So try to be little bit attentive about it. Swimming is a great way to stay fit and healthy but the water in the swimming pool has salt or chlorine in it, both of which can harm your hair. Your hair on constant exposure to chlorine or salt will get too dry, so whenever you go to the swimming pool or a beach, try to cover your hair. Although you may not be able to fully protect your hair when swimming in a pool, you can at least protect it partially by wearing swimming cap and cover your hair. Generally the above mentioned tips to maintain long hair works great for most of us, but if in your case, there is no improvement, then you may try out considering hair supplements. Zinc, biotin, omega3 fatty acids are good for your hair. They elongate the follicles and stimulate the growth of hair. Still, if you feel that you lack the adequate requirement of such hair building nutrients, then try taking their supplements but only on doctor’s advice. Your hair is already long and so trimming a bit of it will not affect much, instead it will prove beneficial for you. The pollution or the various hair styles damages your hair and often leads to damaged cuticles and split ends, which makes your hair look unattractive. So if your trim your hair every 6-8 weeks, it will lessen the amount of damage as well as stimulate healthy hair growth. Which ones are your favorite hair care tips to maintain long hair? I love long hair and believe that straight and long hair enhances the beauty of women. However, whether you are blessed with long hair naturally or have taken efforts to grow it long, you must know how to maintain it. Without maintenance, your hair will lack that shine or probably that volume which you desire. While long hair looks good, it can create lot of hair problems if not taken proper care. More the amount of unhealthy hair on your scalp more will be the amount of loss. It is immensely hurting to see bundles of hair on your comb, your hair pin or hair falling on the floors of your home. Moreover, if you are a woman who spends more and more time in the kitchen, having long but damaged hair may be problematic. This is because you never know when your hair falls and get mixed with the food you are cooking. This is very unhygienic and is certainly a disgusting sight. So better prevent its breakage from before. With proper maintenance like by proper washing, proper combing or by using proper natural ingredients, you can maintain your long hair much effectively. We have already discussed about the top 23 tips to maintain long hair following which will help you maintain gorgeous long locks easily. The list includes many detailing starting with trimming your hair in every 6-8 weeks, doing proper hot oil massage to using right techniques while shampooing or using right hair brushes etc. Little things like how you tie your hair or what pillow cover you are using also matters and so you got to be careful about it. However, you also have to reduce the usage of commercial hair colors, or hair styling tools to maintain your hair. These products contain chemicals that can harm your hair and leave it dry. You also have to eat right to get natural lovely hair. Eat healthy fruits and vegetables, as they are highly nutritious and not just takes care of your health but also helps you maintain long hair. And, never forget to drink plenty of water to hydrate your body and throw the toxins out that in turn will make your hair healthy. Do you have long hair? Do you love those long tresses? How do you maintain it? Have you tried any of these tips to maintain the hair? Share me your feedback after using these tips to maintain long hair. Also, feel free to tell us your suggestions and give information about some other tips to maintain long hair. And, also do like and share the post with others. Until then, love your hair and maintain it and keep it gorgeous and healthy.